I'm trying to measure the light in a room with a simple circuit: a phototransistor connected in series with a resistor. An LED strip changes brightness according to the brightness level in the room. The problem here is that the phototransistor also picks up the light from the LEDs. It is not an option using an IR phototransistor because I also need to measure the light from the room's light bulbs. Also, because of the device's casing, I need the sensor to be surrounded by the LED strip. Finally, I tried turning off the LEDs before measuring does not seem to work, as either the Arduino or the sensor is too slow, to turn off, perform the measurement, and turning back on the LEDs, without a human eye perceiving it. Is there any standard or well known solution to this problem? The LED strip is the WS2812B. The phototransistor I'm using operates between 420 nm and 1130 nm, with peak sensitivity around 850 nm. Furthermore, to specify the functionality I'm trying to achieve: whenever the room is dark, I want the LEDs to be not too bright. If the room is too bright, I want the LEDs to shine brighter as well. Normally you should be able to switch LEDs off, make a measurement and switch LEDs back on without a noticeable delay. Brightness variation is noticeable below 100Hz, which translates to 10ms period. 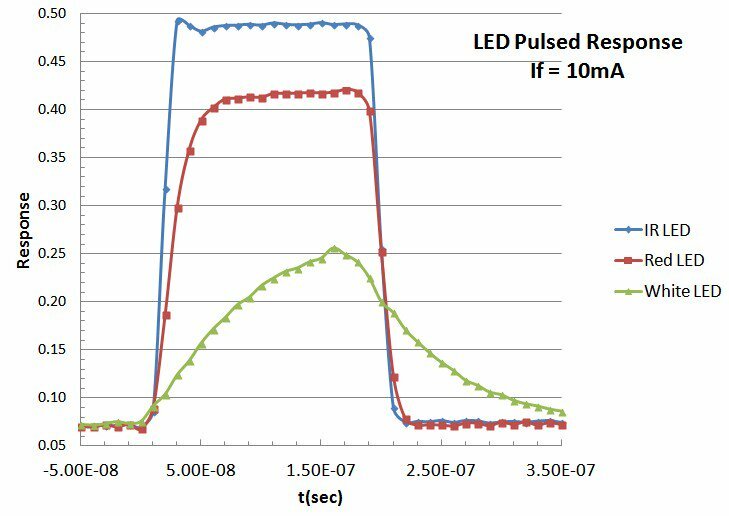 What you need is a photodiode with fast response time (under 0,1ms or so, though there are devices responding in nanosecond range). Phototransistors and LDRs are considerably slower. Regular AnalogRead takes about 0.1ms (and, again there are faster alternatives), so you can easily achieve kHz measurement frequencies where brightness variation is completely unnoticeable. What you can try is to use a color sensor. Since you know the color of the LEDs you control, if the color sensor picks up a different color, you know it is because of other light. Since this is not full proof (ambient color might be exactly as the LED color), you can check color differences (also with a non color sensor). If it differes without you changing the LED, you know there is ambient light (either increasing/decreasing). It also will help if you put the sensor in a tube which is in a different direction than the LEDs to prevent as much as possible picking up the light from the sensors if possible. (if you don't have color sensors you can use a normal sensor with some colored plastic above/around it). Not the answer you're looking for? Browse other questions tagged sensors led-strip or ask your own question. What sensor would detect the black stripe on an analog electricity meter? How do I measure watts without a CT clamp? How to measure ultrasonic sensor without pulsein method? What is a simple way to measure the ambient light?